During Ramadan, the latest Green ReEntry cohort showed off their Level 1 Carpentry skills as they began rehab work on the property at 6055 S. Washtenaw Avenue. Originally built as a single-family home in the 1920s, the property is being restored for 2015 and beyond. Once the renovation is complete, the home will feature an open-layout kitchen and dining room, a huge master bedroom and bath equipped with a whirlpool tub, a private office with a “hidden” spiral staircase, and two guest bedrooms with a full bath. IMAN has actively sought to secure a qualified buyer who has been pre-approved by the lender and the City of Chicago. This potential buyer is one of IMAN’s longest-standing leaders, and a pioneer in our reentry work. Please keep him in your prayers! IMAN recognizes that today’s growing green building industry is a promising place to launch a successful career. 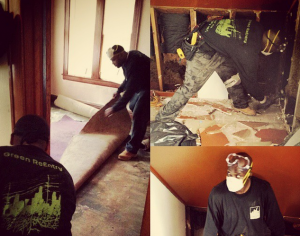 The beginning step for the Green ReEntry crew was deconstruction training, a skill that serves as an entrée into virtually every trade within the construction industry. 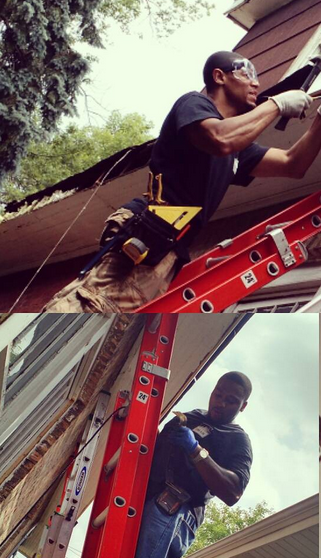 With the skills they acquire working alongside other skilled tradesmen on the job, the Green ReEntry program participants have the potential to become construction foremen, carpenters, electricians, painters and plumbers. After just the first week of deconstruction training, our crew members were complemented on their work ethic. Supervisors told them that they had all the qualities necessary for a successful career as contractors in the industry! This entry was posted in Direct Services, One Chicago by IMAN Staff. Bookmark the permalink.